OC Global’s Road Transport Division has more than 50 years of experience in all phases of road construction, from preliminary designs to completion. 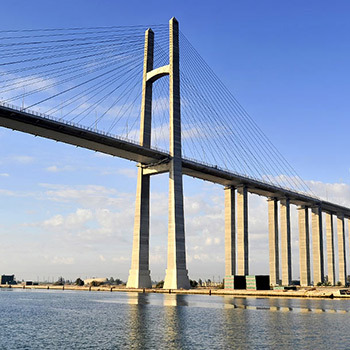 Our major works include the Suez Canal Bridge, a bypass highway outside Colombo in Sri Lanka, and road and bridge work in Bangladesh that involved refurbishment and new construction. Our expert teams include transport planners, highway planners, civil and structural engineers including bridge and underground engineers and landscape architects. During the planning and design process, they work closely with our environmental and social consideration experts to make sure the projects harmonize with local needs. The range of our services spans the conventional to the most advanced technologies. Our services can be provided as a package to correspond to the multiple tasks required of project implementation. All these attributes allow OC Global to deliver the highest levels of quality and safety covering all types and scales of projects. We aim to be the consultant of choice, providing safe, sustainable and cost-effective solutions. Road transportation is a key component of transportation infrastructure. OC Global provides optimal solutions, taking into account a cost-effective balance between construction and operational costs, while seeking to limit negative impacts to the society, environment and climate. OC Global has been involved in many bridge projects around the world, from the world’s longest spans to unique pedestrian crossings. Our experts provide advance techniques and innovations to design some of the notable bridges around the world. Construction of tunnels and underground structures are part of a complex process that needs affiliated services, including safety audits, risk management and assessments. OC Global has extensive experience in immersed tunnels around the world. Our activities are expanding to the engineering of tunnels in mountainous areas and undersea, as well as other underground infrastructures, anywhere on Earth.